Welcome to Gemini Group’s Resource Library! We’re glad to share what we’ve learned over the past 45+ years. In fact, we encourage you to ask questions – we’re here to help you succeed! That’s why we’ve created the following resources. If you have any questions or need more information about a particular process, our technical sales specialists are standing by to help! Give us a call at 248-435-7271 or shoot us an email at plasticsales@geminigroup.net. Two-shot injection molding delivers a high level of accuracy and repeatability and reduces production steps, cycle times, and overall costs compared to traditional molding methods. Learn how to optimize your design for this process with our new design guide. Download your copy today! 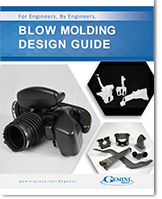 This guide contains information and diagrams specific to the Blow Molding process that will help you develop a solid understanding of several important design and material property factors to consider when developing a blow molded part. Click the button below to get started. We would also be happy to discuss any comments or questions you have pertaining to the information it contains. Blow molding produces hollow plastic parts with speed and repeatability. It’s best for difficult dimensions and high volumes. 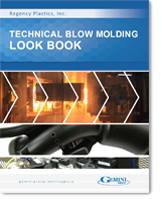 See what can be accomplished with technical blow molding in our new look book of blow molded parts. Download your copy today! 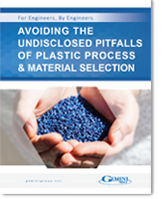 This guide covers general information related to the plastic extrusion process and introduces some important design, material, and cost considerations. 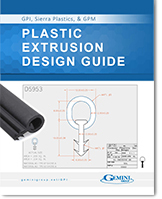 In addition, this guide also contains information and diagrams specific to the thermoplastic extrusion process that will help you develop a solid understanding of several important design and material property factors to consider when developing an extruded part. Click the button below to get started. We would also be happy to discuss any comments or questions you have pertaining to the information it contains. You want to design your seal right the first time. Minimal changes, minimal headache. We’re right there with you. 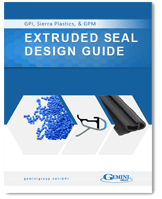 This guide provides the basic guidelines for designing extruded seals and weather stripping – from the perspective of an experienced extruder. Get your copy and dive into the extrusion design process today! 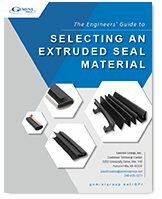 Selecting the right material for your extruded or co‐extruded plastic seal applications can be a daunting task. You need confidence that you’re choosing the right material for the job. This resource will guide you through the most critical considerations so you can make the best choice possible. If your still thinking rubber when it comes to seals, now’s the time to re-consider and we are here to help. 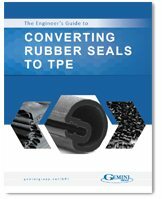 This guide provides the basic guidelines for converting rubber seals and weather stripping to TPE – all from the perspective of an experienced seal engineer. Get started today! This report contains important questions and detailed information to carefully consider in order to select the ideal manufacturing process for your custom engineered plastic components. Click the button below to get started. We would also be happy to discuss any comments or questions you have pertaining to the information it contains. Regardless of the manufacturing process, there are dozens of factors to consider when selecting the material for your engineered plastic part. This questionnaire contains several questions you need to answer in order to identify the best resin for your application – and we are always here to help you with any additional questions you may have. Get Our Latest Insights & Tips On Our Blog! Your go-to for the latest advancements, insights, and tips in engineered plastic and metal products.